Mission: To transform the favelas of Cantagalo and Pavão-Pavãozinho into a monument commemorating the history of Rio’s favelas, the cultural origins of samba, the culture of migrants from Brazil’s Northeast, black culture, visual arts, and dance. 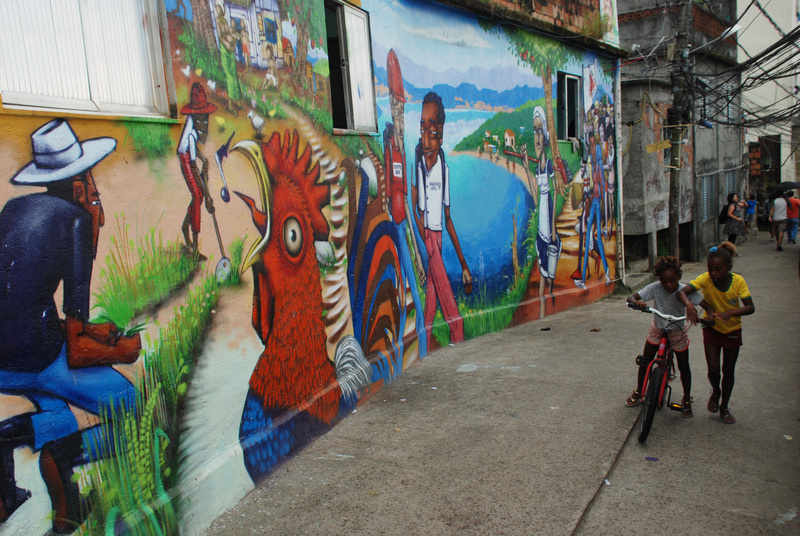 Public Events: MUF offers guided visits of its Open Air Gallery—a tour circuit of painted houses that tell stories and depict community memories—and a guided eco-hike to Caminho do Alto, which engages with memories of nature and the favela’s ecological history. MUF also organizes activities to bring together residents and visitors, such as CineMUF film screenings, a traveling library, English courses, and a shop that sells locally made handcrafted goods. How to Contribute: Participate in one of the tours offered (get in contact to set up a date and time in advance), buy crafts made by residents at the store, donate to support the museum, and support the community’s local economy. MUF is also looking for volunteers and interns to help with teaching and storytelling at their children’s play area. Perched on the hill between Ipanema and Copacabana, the favelas of Cantagalo and Pavão-Pavãozinho overlook some of the most iconic (and expensive) neighborhoods in Brazil’s “Marvelous City.” For many visitors, this hill is the first glimpse into a reality that is distinct from the more widely visited landscape of Rio’s South Zone, characterized by sunny beaches and luxurious hotels. Around 20,000 residents of Rio call the communities of Cantagalo and Pavão-Pavãozinho home. The history of these communities dates back to the arrival of former slaves from Minas Gerais (who settled in Cantagalo) and from Brazil’s Northeast (who settled in Pavão-Pavãozinho) in 1907, attending to the areas below: this was around the same time that Copacabana’s urbanization began. 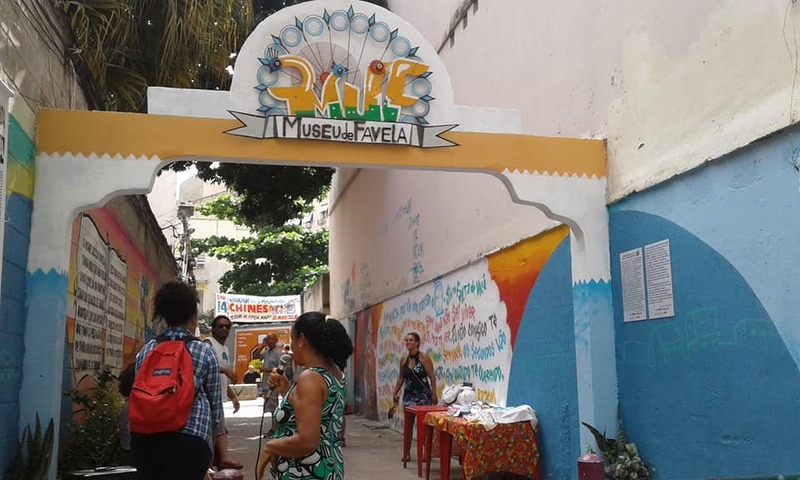 With its headquarters based at a church in Cantagalo, Museu de Favela (MUF) is a community-based initiative that aims to value the favela’s memory, make its history public, and support local cultural life. The museum is not a physical site that you can pick out in the landscape. Rather, the concept is that of a territorial museum: the space of the favela becomes the museum’s focus, and everything contained within the community’s limits becomes part of the “archive,” so to speak. This upends traditional, elitist notions of what constitutes a museum and who museums serve, making a statement that favelas—and this favela, in particular—contain troves of culture and history that must be valued and preserved. Sidney Silva, known as Mestre Tartaruga by his capoeira students, has lived in Cantagalo for all 47 years of his life. He owns a capoeira school, is one of MUF’s directors, and is a respected community leader. Much has changed since Silva’s childhood—access to electricity, basic sanitation infrastructure, and street pavement, for example—but Silva is quick to point out that these changes should be seen as gains achieved by residents, not by politicians. Likewise, MUF is an initiative that emerged thanks to residents’ dedication to improving their own community. MUF was founded in 2008 in the context of the Growth Acceleration Program (PAC)—a national development program created during the administration of former president Luiz Inácio Lula da Silva that included funding for favela upgrading projects. In Cantagalo and Pavão-Pavãozinho, these funds were utilized to partner with public universities to offer courses in the community. 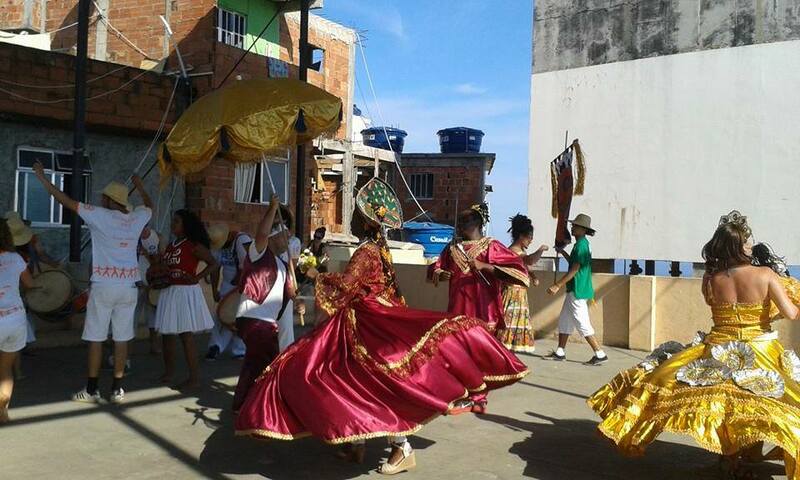 Residents requested courses in museology and tourism, through which they learned about the idea of ecomuseums and decided to explore the ways in which the concept could be applied locally, taking advantage of the favela’s location and touristic potential to generate important resources for the community. The project brought together sixteen community leaders, the museum’s original founders—“a diverse, talented group of artists, musicians, singers, hip-hop and samba composers, recognized community leaders, radio hosts, journalists, capoeira dancers, artisans, photographers, an architect-urbanist, a former businesswoman, and a lawyer.” The museum’s leaders—from its founding to the present day—are mostly women, most of whom grew up and continue to live in the community. MUF refers to both the territorial museum—which includes every house, street, and person within the favela complex—and to the organization that functions as a “cultural umbrella,” as Silva likes to call it, uniting and supporting cultural initiatives throughout the entire community. These initiatives include community radio projects, music lessons, performance groups, music by Alini Rangel, graffiti by Carlos Acme, and Silva’s own capoeira school. MUF also organizes regular activities of its own. The organization hosts free film screenings (usually showing films with social or cultural themes) at various locations in the favela through an initiative called CineMUF. By inviting both residents and outsiders to attend, the organization creates a space for new connections and dialogue between people who might otherwise never have met—whether between residents and visitors or between members of the same community. Another important space is the brinquedoteca (a play area), where local children can go to play with a collection of toys and books, engaging with one another and adult volunteers. MUF also organizes workshops and language courses, particularly in English and Spanish. Additionally, the organization maintains a store that sells handcrafted goods made by residents of the community, enabling visitors to financially support all of these projects. MUF’s first exhibitions was the “Illustrious Old-Timers” series. For the exhibition, organizers interviewed thirteen longtime residents of the community about their childhoods and lives in the favela. 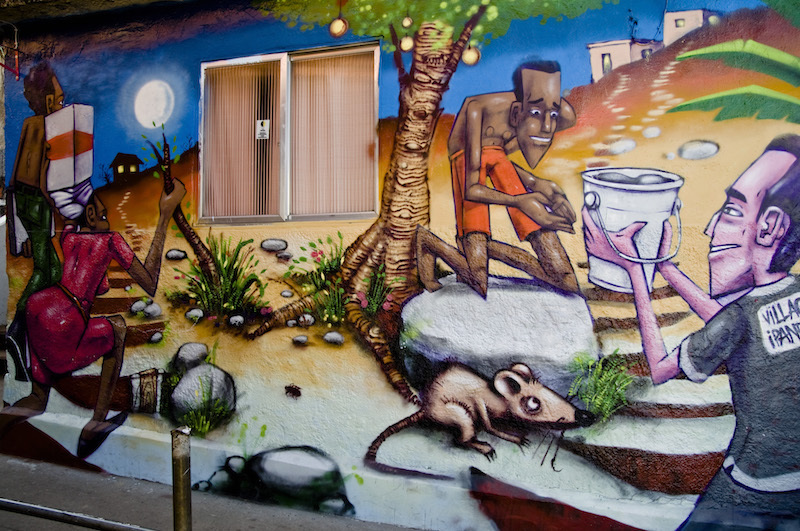 Using material from these oral histories, Carlos Acme—a world-renowned graffiti artist and one of the original founders of MUF—brought in a team of artists who painted these stories onto the walls of houses in Cantagalo and Pavão-Pavãozinho. In doing so, the art became part of the houses. Residents could then choose whether to keep the art or paint over it. 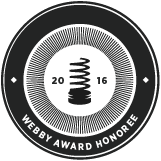 Most have chosen to keep it, identifying with the art and the stories depicted. Collectively, these paintings recount the histories of Cantagalo and Pavão-Pavãozinho. Plastered onto walls before the keepers of these stories fade away, the exhibition provides visitors with a window into life in the community and empowers residents to value their own history. Another hallmark of MUF is the “Women Warriors” exhibition and awards, given to exceptional women from the community “whose life stories most represent the collective memory of this favela complex.” After being selected by a committee of residents, the women are interviewed and their stories are transformed into decorated posters that are paraded around the favela on the day of the awards ceremony, picking up the recipients at their homes along the way. At the end of the day, participants celebrate with samba and barbecue at the MUF headquarters, gathering in honor of the women who have built the foundations, pillars, and roofs of their communities—figuratively, and sometimes, literally. One of MUF’s most critical roles is that of mediator: MUF brings together several diverse sectors of society, always in the interest of supporting local residents. The organization unites residents and visitors by telling the stories of longtime residents—acknowledging the importance of outside attention but also insisting on the community’s capacity for self-recognition. Those involved with the museum are cultural agents and change-makers who facilitate experiential and cultural exchanges with other favelas in Rio, thus resisting fragmentation and working to build solidarity among favelas. The organization also acts as a mediator between residents and the government, fighting for residents’ right to permanence in the face of eviction threats and juggling the interests of the many stakeholders (from within the favela and outside of it) that aim to have a say in the community’s future. 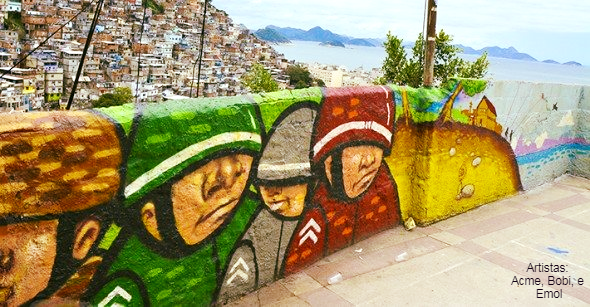 Finally, due to its location in the South Zone, MUF occupies a unique place of visibility—both within Rio and internationally, allowing the organization to challenge stigmatized perceptions of favelas and paint a picture that is distinct from the negative images that commonly appear in the media. The museum plays a critical role in community organizing, providing spaces and opportunities for residents to come together—to learn, talk, and work—in order to meet collective needs. Perhaps one of the most powerful ways that MUF plays this role of mediator is by fostering engagement between the favela and the “asphalt”—the formal city. “I believe the purpose of the museum is to link the city and the favela, to construct a single city from it all,” says Silva. MUF foments participation on the part of residents by lending strength to community initiatives and by cultivating the powerful idea that favela residents, too, are part of the city—countering stigmatizing rhetoric that posits favelas as separate urban spaces and favela residents as a subclass with no right to participate in the city. This starts with the idea of the museum itself. MUF is registered as a national museum and forms part of a network of museums located across the city and throughout the country. Earlier this year, MUF’s base served as a distribution point for museum passports, which grant free entry to over seventy museums and cultural centers in Rio. 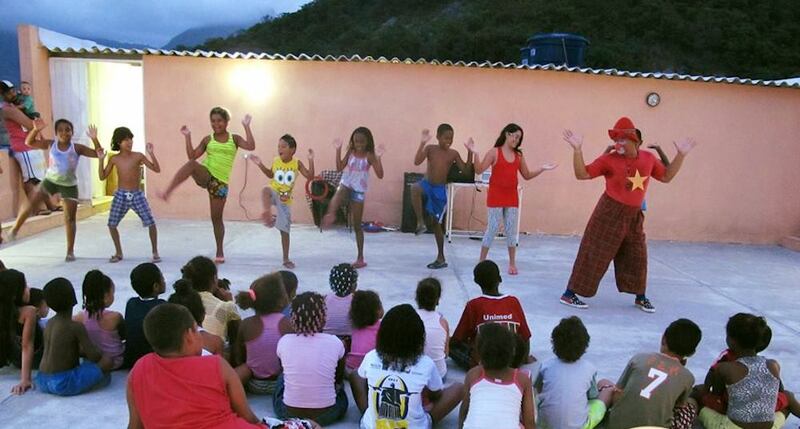 Through initiatives like this, residents gain access to cultural offerings from which favela residents are often barred due to price, prejudice, or lack of accessible information. Beyond affording access to formal cultural institutions, these exchanges encourage residents to recognize that the favela’s history and reality—local ways of knowing, living and understanding—are just as important as those of the formal city. Moreover, these initiatives encourage residents to understand that the favela is an essential and foundational part of that city and must be commemorated and preserved as such. Particularly acute is the struggle to preserve Afro-Brazilian memory and culture in a community that is experiencing the growing influence of the evangelical church and in a society with an increasing current of intolerance of Afro-Brazilian religions. Speaking on his experience as a capoeira instructor in Cantagalo, Silva describes that Afro-Brazilian religions are often demonized and that Afro-Brazilian culture like samba and capoeira continue to be marginalized. He sees this as a form of “erasing our own history as a nation… bit by bit, you lose traditions. Capoeira is a connection to Brazil’s history. It has this whole historical context—of the slave who needed to escape the slave quarters and hide away in the quilombo.” Seeking to keep Afro-Brazilian cultural expressions alive, Silva tells this history to all those willing to listen and passes it on to future generations through his capoeira school. “Capoeira won’t die because I won’t let it,” he states. Silva emphasizes that the city of Rio de Janeiro owes a great deal to favelas and favela residents—much of the city’s culture and workforce, for example. For Silva, it’s critical for favela residents to know this history and current reality so they understand their true place at the heart of the city. Otherwise, it’s easy for these truths to be erased and for favela residents to be taken advantage of: “That’s what the system does—it breaks down the entire chain of history—from the beginning of slavery to the occupation and expansion by the French, Dutch, Spanish, and Portuguese. The system erases their history, knowing that they’ll forget—that they’ll be slaves forever, continuing to work for minimum wage. We’re always stuck in this cycle. The masses are always the ones held hostage; either we suffer under violence, or we’re stuck in our place.” It is this impossible dilemma that MUF resists by keeping the community’s memory alive and igniting residents’ consciousness to demand rights and assert their place in the city. 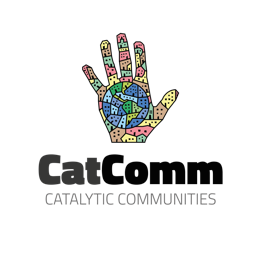 *Museu de Favela is one of over 100 community projects mapped by Catalytic Communities (CatComm), the organization that publishes RioOnWatch, as part of our parallel ‘Sustainable Favela Network‘ program launched in 2017 to recognize, support, strengthen, and expand on the sustainable qualities and community movements inherent to Rio de Janeiro’s favela communities. Check out all the profiles of mapped projects here. This article was written by Paula Peña, and published on November 14, 2018.